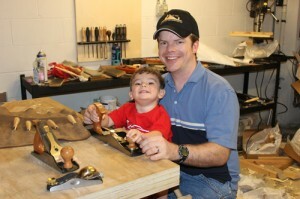 Congratulations to Jacob Coulter of Waukee, Iowa on winning Highland Woodworking’s 2012 Lie-Nielsen Hand Tool Giveaway! Jacob: I started woodworking as a child with my father. Our first real project was building 3 rocking horses, one for us and 2 to give away. After growing up, I spent most of my time on construction projects and a couple of built-ins. When my own kids started getting big enough, I decided to build 3 again. After that, I built a child’s table and benches that get daily use and helped my brother-in-law Joe build a few end tables. I had always been a power tool user, but cutting wide bevels and fitting pieces on the rocking horses opened my eyes to how well hand tools work. I lucked out at an auction and managed to get a few nice 100+ year old planes and, after a lot of trial and error, learned how to use them. Internet forums are a great source of information for this. I’ve been moving more and more into hand tools. I even sold my table saw! My 14 year old brother-in-law Jack visited us for a month and we worked on several projects, digging into hand tool use – TV trays, a work-box, and a bench hook to name a few. I was able to set him up with a basic set of tools, and it is amazing to see him work with them. It brings me a lot of joy to be able to pass on these skills. I also have 5 children of my own (not bad at 29!) and they love getting there hands into everything. Even my 2 year old love’s using a spokeshave! Hand tools allow 3 of my children to be in the shop working with me. My 5 day old twins will have to wait a little longer for shop time though! Jacob: Once I learned about decent hand tools, Highland Woodworking came up again and again so I’ve spent a lot of time on your website. I was really excited when I saw the banner add for the contest. Jacob: I really had difficulty believing I’d won! It is quite an awesome prize. I never expected to own tools of this quality. I’ve definitely ogled them for a while, but never thought I’d own them! Jacob: First thing will be completing my wife’s nightstand, which unfortunately is several years in the making. I couldn’t bring myself to use a belt-sander on the top, but these planes should make short work of the difficult grain. There is some overlap between my existing tools and these heirloom quality tools. Whoever put this prize together gave it a lot of thought and it covers most of the bases for a beginner. I’m looking forward to handing down some of my good older tools to help spread the fun of hand tool use. I’ve already sent a few more to Jack who’s set up a small shop at his parent’s home. Jacob: Woodworking is a lot of fun, but hand tools add a completely new dimension to it. I haven’t met anyone yet who didn’t smile after a seeing what a finely set plane can do. I’ve really wanted to know what an heirloom quality tool could do, and now, thanks to the generosity of all the folks at Highland Woodworking, I have that chance! Visit our complete collection of Lie Nielsen Hand Tools! The May Issue of The Highland Woodturner is out! The Modern Woodworker’s Association Visits Highland!